Are you looking to work in a team environment and have weekends off? Luttrell Staffing Group in Sevierville, TN is currently hiring for Quality Control | Warehouse positions in beautiful Gatlinburg, TN. This position is either 1st or 3rd shift; if you are interested please apply today! Apply today by clicking on the link below, then contact our office at 865-428-1412. We look forward to hearing from you! Kim began her career with Luttrell Staffing Group in 2013 when she accepted a clerical assignment for a client company. She did such a great job there that the Sevierville branch offered her an internal administrative assistant position in 2014. The next year, Kim was promoted to staffing manager. 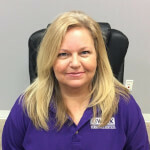 She has over 30 years experience in customer service and hospitality, and is certified by both DATIA (drug testing) and the American Staffing Association (CSP).